Update: United 93, Blak, Survivor, Jesus Camp, ect. Looking at boxofficemojo.com's sunday estimates, it looks like United 93 should come in 2nd with 11.6 million dollar weekend gross. With RV estimated at 16.4 million and Stick It right behind with 11.2 million (I'd be really disappointed if somehow Stick It jumped ahead when tomorrow's official numbers come out). The big question has been are people ready for a movie about 9/11 yet and it appears that many people are ready. I still have not seen it, but I'm very impressed with it's 93% freshness rating on Rotton Tomatoes of the 135 critics they have so far listed. I applaude director Brian Greengrass on his success. I'm much more concerned about the quality of Oliver Stone's upcoming film World Trade Center. Got some great feedback on this post! Especially enjoyed what I learned about the original starbucks logo (thanks Paula and James). Also thanks Augustus for your comment about what's going on at Saddleback with Rick Warren and the purpose driven country of Rwanda. (If anyone knows more I'd still be interested). Also, Richard McElroy asked that if I tried Coca-Cola's new product Blak that I give an update. Well I tried Blak last night and well...it's kinda Blllaaaak. It's not horrible but here's how it goes...at first it taste like Coke, then it taste like Coffee, than Coke...then no aftertaste...then thirty second later you have an after taste again. There is definitly a reason it only comes in 8 oz. bottles because I certainly wouldn't want more than that. Courtney is gone! With one of the most interesting and fun episodes in Survivor history...Terry is unstoppable and Cirie has her head in this game in amazing ways. I hope final two are Cirie and Terry because that would be an interesting match. Jeremy Baker is right, Terry is unstoppable! And You Thought "Salute Your Shorts" Was Interesting? Loved Andrew West recommendation's for other camp movies: "Meatballs," "Wet Hot American Summer," and "Happy Campers." I also really appreciated Destiny's mini-review in the comment section of "Jesus Camp" which she had a chance to see in New York. Definitly read her comment...it's fantastic. I thought Destiny's comment was interesting when she said that: "I would imagine that a Christian would find this film an accurate portrayal of Christian life and of the morals that they wish to pass to their children..." I find this comment a little disturbing because I think that while this camp would probably be exactly what some psycho-intependent-fundementalist-home-schooling-right-winged-conservative-Christians might find normal, I would believe that many Christians might be disturbed that people would see this as a false norm for Christian child raising. Tomorrow is the day without a Latino. I'd also like to say while I thought this movie was relatively painful many people commented about their enjoyment of the film, so feel free to judge for yourself. I'd be interested to hear anyone's stories about how "A Day With Out A Latino" did or did not effect their day. Who knew immigration and issues with a Mexican border patrol issues would be a big national buzz issue. Last night when I saw "Thank You For Smoking." During the previews, I was excited to see their was a preview for "A Prairie Home Companion." This obviously is one of the big films for 2006...how can it not be with Robert Altman directing the film (did you know that P.T. Anderson was a back-up director for the project in case Altman was unable to finish directing...I thought that was interesting). But with the star studded cast (Garrison Keillor, Kevin Kline, Virginia Madsen, Tommy Lee Jones, John C. Reilly) I haven't heard anyone mention that Linday Lohan was in this movie...and she actually looks like she plays the role pretty convincingly. Bobby - Emilio Estevez's project about the people in the hotel where Robert Kennedy was assassination. Anyways, I wonder if Lohan is going to move into the world of "serious acting" or remain in the world of teen idol, or how this 18 year old will reinvent herself as she moves out of her teens in the next couple years? 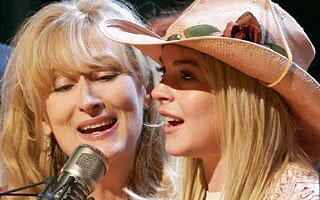 The picture above is of Meryl Streep and Linday Lohan from A Prarie Home Companion. Hank Hill's family on King of the Hill look for a new church. Jesus Camp: Story of Evangelical Christians at "Kid's On Fire" summer camp at Devils Lake, North Dakota. Apparently deals a lot with a Christian camp teaching children about Christian-fundementalism, particularly in terms of political issues: homosexuality, evolution, abortion, and George Bush. Premiered this past week at the Tribeca Film Festival. 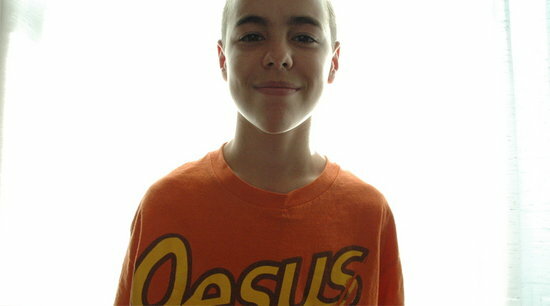 Camp Out: The story of 10 kids who are the first to attend an overnight bible camp for gay and lesbian Christian youth. The kids at this Minnesota camp apparently talk and show a good deal about the isolation that these teens feel both from the Christian community and the homosexual community. Premiered recently at the Clevlend International Film Festival, among others. Summercamp! 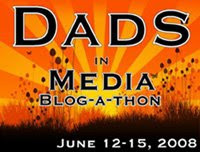 : This is the story of a more "traditional camp" setting (say "Salute your Shorts"). The film makers film and document the full camp experience of Swift Nature Camp in Minong, Wisconsin. While showing regular camp activities, it appears to address the regular issues kids experience as they grow up. Premiered last month at the SXSW film festival in Austin, TX. originally discovered at the film chat blog. 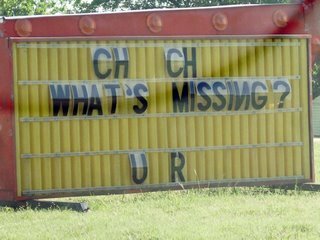 It's been a while since I've posted one of these, but this is church sign #16 in the series. Two of my friends are the proud parents of two lovely turtles: Squirt and Slider. While my friends were gone visiting a couple schools in California, they asked my wife and I to feed these two lovely turtles. (And I'm talking, go over once and feed the turtles, not a daily commitment at all...just dump the bag into the tank). 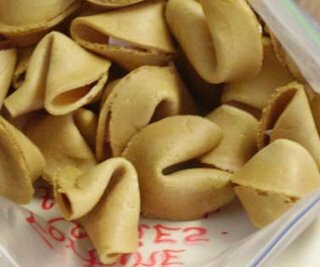 But when they came back they brought with them fortune cookies from San Fransisco that they had written messages for and had hand wrapped. (A bag had been prepared for us and for another couple friend of ours who else fed the turtles once). You will soon win a lifetime of motovational posters. Do you have a day when you don't want to do your job. Yeah, that's like today for me. So this is all you're getting. You'll soon eat a hard starchy substance. The moral of story: Good things come to those who feed the turtles! Thanks J & G for your great friendship! But who could have guess this? The amazing cast of Soderbergh's Ocean's 11 franchise just got super-sized. Al Pacino is joining the cast for this second sequel. Pacino will be playing the part of Willie Banks, a Las Vegas hotel/casino owner. Digital Spy predicts this is where the George Clooney's gang will attempt their robbery. Wow, pretty impressive. 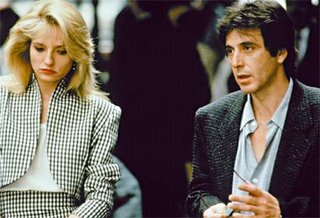 The picture above is from the movie Sea of Love, a 1989 film staring Ellen Barkin and Al Pacino (this is the film were Barkin got her 1st big break...could Oceans 13 bring her new notoriety?). 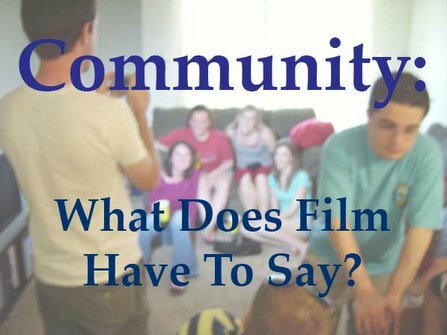 Community: What Does Film Have To Say? Despite our passionate desire for independence I think we also have a strong desire to be interconnected with others. I recently rewatched the movie Grand Canyon (the 1991 film about race and violence, that some have compared to Academy Award winning film Crash). Grand Canyon, like Crash, is one of many films that deals with multiple characters who you would think otherwise wouldn't interact with one another but end up being uniquely connected through certain situations and relationships. (For example, Robert Altman's Short Cuts and P.T. Anderson's Magnolia). And it doesn't have to just be the bizarre relationships that draw us together. There are some really great films that don't just deal with our "it's a small-world" web of relationships. Favorite films of mine like The Station Agent, In America, and Pieces of April all demonstrate our desperate need for others in our life. Yet the in order for us to have genuine relationships with others we need to give a little bit of ourselves. I love how in Grand Canyon, Mack (Kevin Kline) revisits tow-truck driver Simon (Danny Glover) over breakfast, and in turn Kline's character begisn to draw on his personal connections to help Simon's extended family and enrich his personal life. I think this is a great relationship because I think this is the type of influence we long to have in the lives of others. And yet I don't think we want to have to go to much effort. Or maybe we're willing to go to the effort but we're pulled in lots of different ways so we never do anything. But I think the biggest problem is that when we are forced to interact with others who are different from us we get uncomfortable and shy away, and it's only when we are forced to interact in meaningful ways with strangers will a process of that nature even begin. It's when Katie Holmes over breaks in Pieces of April that she meets many of her neighbors and forges relationships with them. And it's not until a horrible accident occurs that Matt Dillon and Thandie Newton are able to experience any sort of redemption in Crash. I think it's clear in cinema that community serves a valuable function, but it also takes a lot of effort. (Think of how much effort it took for Joe to begin to be a part of Finbar and Olivia's life in The Station Agent). But there is joy and support and comfort in those relationships. The most beautiful picture of community to me is the way that the love of two little Irish girls in Jim Sheridan's In America begin a transformative process in the life of a dying artists and their own family. Look forward to a future review of the album "I Wish We All Could Win" by the Afters soon (with the hit single "Beautiful Love"). I have been contacted by their promotions company and am being sent a CD to review. You can hear their music on the Afters Media Player. It's pretty exciting since I was contacted to do this review, and wanted to make it known that I would be more than willing to consider reviewing other artists and media. If you are interested e-mail me a strangeculture@gmail.com. 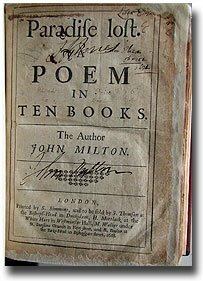 Paradise Lost: John Milton's epic poem from 1667 has shaped and created much of the Western perceptions about Satan, God and the fall of man. Now it's been greenlighted for a $100 million film adaptation directed by Scott Derrickson (director of "The Exorcism of Emily Rose"). (See here). I wish they wouldn't make this film because of the complexities associated with the fact that the Paradise Lost crew will make decisions that will largely effect how people view and picture this spiritual events and issues, further establishing a non-cannonical interpreted cliff notes to the biblical story. I am also very curious who they would cast in this film for the gutsy and interesting part of Satan. Satan's role is a strange one as he the central charcter, the protagonist. Satan is the one trying to overcome his own fears. This is a character that has complexity and intrigue...while God's character is rather flat in comparison (God is not neccesarily boring, just not in crisis the way that Satan is). I kind of picture the part going to Christopher Walken. But what about Willem Dafoe, Colm Feore, Peter Sarsgaard, Johnny Depp, or Tim Robbins. Tonight was my second time in my life I have been lucky enough to experience one of the coolest most unique musical groups I have ever seen. The musical group's name is MASS Ensemble. And tonight, like in the past, I have seen and experienced the group at the Main Street Arts Festival in Fort Worth, Texas. The group is indescribable as most of the instruments that they play are unique to MASS. They are most famous for their large Earth Harp with unique wire strings that can be stretched many many yards...unfortunatly tonight they didn't have the Earth harp (which I had seen last time I saw them), but tonight they did have the boat harp which was 25 feet long. This string instruments they play are performed on with resin covered gloves. Also tonight they had the drum orb which is a huge round metal structure with multiple drum heads and the aquaguitar, an instrument that incorporates three unique guitars into one. Check out their website massensemble.com to see and hear really interesting video and sounds of this very eclectic musical group. I predicted that the final four would be Aras, Bruce, Bobby and Sally...and two weeks in a row I have lost two of my predicted final four...Sally who toughed it out much longer than you could have thought...and then tonight Bruce had to be sent off the island for severe bowel and intestinal blockage...yikes! (Not quite as dramatic as when Michael Skupin fell into the fire in Survivor II: The Australian Outback). So now only Aras of my initial predictions is left...so I am going to have to go with Aras as my prideful hope for a winner. I also said in my Februrary 1st predictions that: "I don't think Shane, Terry or Cirie have a chance." Well now with only 6 contenders left all three of these people are in and I think we can all see that Terry and Cir ie certainly have a chance...my foolishness. My prideful side's cheering for Aras, but the rest of me is cheering for Terry and Cirie. Would Spider-Man have any skills if he were fighting evil in the desert or on the moon? Is Senator Wayne Allard (Colorado) really as bad of a senator as Time says in it's most recent issue? 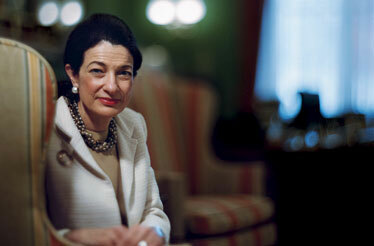 Why do I think of Harry Potter every time I see a picture of Senator Olympia J. Snowe (Maine)? (pictured right from Time). Why did Tom Cruise and Katie Holmes name their baby Suri? Were they thinking at all about how Suri Cruise sounded? (Not only does it sounds stupid but it sounds like Syracuse to me...Moses and Apple are much better names). With record high heat and rolling blackouts in Fort Worth is it wrong for me to think of Enron? Where did the Starbucks logo come from? Does the movie "There Will Be Blood" directed by P.T. Anderson have any chance of being an Academy Award winner as Will Gray predicts on his blog? I remember a Time article my wife told me about where Rick Warren was trying to make Rwanda a purpose driven country...how that's going? I wonder what Coca-Cola's new coffee flavored beverage Blak taste like? I still haven't tried it. I have wondered why I get so many searches from Malaysia of people looking up Monica Pang on my blog...so I decided to check Monica Pang's name on Google News. 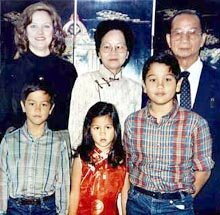 Well apparently, Monica Pang visited Malaysia as I discovered on google news because that is were her grandparents live. Allow me to cut and past the first paragraph of an article from Malaysia Star about her visit...see if you can find anything interesting. Except from Running with Scissors by Augusten Burroughs. St Martin Press, New York. 1992. Pages 76-77. All the Finches did bible-dips. It was like asking a Magic Eight Ball a question, only you were asking God. The way it worked was, one person held the bible while another person thought of a question to ask God, like, "Should I get my hair cut short?" Then the person holding the bible opened it at random, and the person asking the question dropped his or her finger on the page. Whatever word your finger landed on, this was your answer. The doctor so so entusiastic about bible-dips as a direct form of communication with God that most of his patients performed them. Although nobody did as many dips as Hope. I held the bible and Hope closed her eyes. "Ready?" I said. She opened her eyes. "Okay." "Oh my God." Hope said. "That's just incredible." "I asked if the fact that I missed Bookman means that I shouldn't visit my friend Viv on Friday, if that was a sign." "Well so," Hope said. "I got awakened. And to me, that means that I would be disturbing Vivian if I vistited her. She did have a cold last month and she's seventy-four. So she probably needs her sleep. If I showed up on Friday, I might wake her up." I nodded my head and Hope looked up at the ceiling. "Thanks, God," she said. Hope and God were buddies. Theirs was not a formal relationship steeped in ritual and tradition. It was more of a close yet casual friendship. Apparently Mel Gibson forgot to check the farmers almanac, but report is that a rain delay has slowed down the production of his latest film Apocalypto (see my post here for more on the film). Now instead of coming out in August it is coming out December 8th instead. Sure, maybe rain is the reason, but I imagine that Disney and Touchstone pictures are realizing that this does not have the buzz it needs to be a summer blockbuster and that perhaps they need to campaign for the film differently and place it in the prime of award and family film season. And at this point it doesn't look like Disney has too many films to campaign for come award season, unless they have high hopes for their gynastic themed film Stick It. 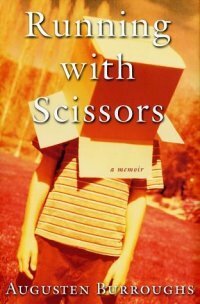 Just finished reading the book Running With Scissors by Augusten Burroughs. This best seller is a memoir that was published in 2003. Part of my interest in reading this book was that it was a memoir, it sounded interesting, I knew some people who spoke highly of it (namely students at my school), and I knew they were making a movie of this memoir. The book basically outlines the chaotic life of Augusten from 12 to 17 (mainly focusing on when he was 13 & 14). The chaos begins to spiral out of control with Augusten's family when his psychotic mother ends up leaving Augusten for a week at her psychiatrist's (Dr. Finch's) house for a week, yet with his mothers instability even after a week, the crazy doctor's house becomes his second home. The book has horrific moments in it including his mother's psychotic meltdowns, and the horrific events which Augusten experiences at Dr. Finch's house, a place where everyone is free to do whatever they want and his patients (current and former) visit the pink house falling in shambles of chaos. 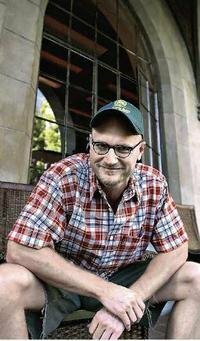 Yet by far the most disturbing and graphic moments of the book deal with the molestation of sexual exploits with Augusten and Neil Bookman who begins a sordid love affair with Augusten when Bookman is 34 and Augusten is 13, the homosexual molestation relationship they form lasts for years. Augusten Burroughs writes this memoir with a sense of humor, but it is certainly one of those books where everything is so bizarre you can hardly believe it. While at the same time the details are so specific you feel as though you have no choice. This will be a very interesting movie because of the high caliber cast involved in the film. Annette Bening plays Augusten's psychotic mother, while Alec Baldwin plays his distant alcholic father. Brian Cox (L.I.E. and Stryker in X2) plays Dr. Finch, and two of his daughters are played by Evan Rachel Wood (Thirteen) and Gwyneth Paltrow. Joseph Fiennes plays Neil Bookman, and Gabriel Union (Love and Basketball) and Kristin Chenoweth (Tony award winner and Annabeth Schott on the West Wing). 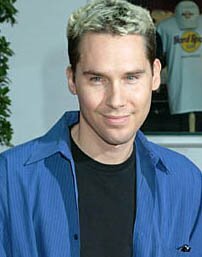 The film is directed and adapted by Ryan Murphy, the creator, director and head-writer of the television show Nip/Tuck. Early Film Thoughts: This film set to be releases September 22nd, seems like it could go a lot of ways. If they try to draw out the comedy, it would remind me of Wes Anderson's film The Royal Tenenbaums, largely because of it's randomness and bizarre ensamble characters that quality actors will be playing. I imagine Running with Scissors has a good chance of being a top film for a number of critics and fans, but not to be a big movie among the average movie goer. I also could see it scoring some acting nominations and maybe a writing nomination, for Murphy. I don't know if Bee Season was a good book, but the movie is pretty mediocre. 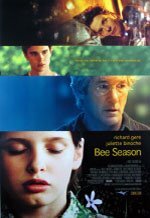 Bee Season is based on the book (with the same title) by Myla Goldberg. I'm sure the movie left a lot of stuff out from the book, because that's typical, and this movie seemed to be hinting at characters and storylines that were greater than what the film was able to offer. The movie deals with a family's multi-faceted problems that begin spiraling out of control at the same time the youngest member of the family discovers an amazing ability to spell and succeeds in many levels of the national spelling bee. The film stars Richard Gere, Juliette Binoche as the parents. The young girl who plays the spelling-bee-daughter is phenomonal. The actresses name is Flora Cross and could easily p lay the daughter of Juliette Binoche in any movie, they look very similar. Spiritual searching plays a large part in this film, in fact, I would say that's the motif of this film, particularly grounded in Richard Gere's knowledge and fascination with Jewish mysticism and the Kabbalah. I was curious about Goldberg's faith and was curious if there was a purposeful agenda she was pushing, and really, I don't think she was, especially after reading some of the interview here. 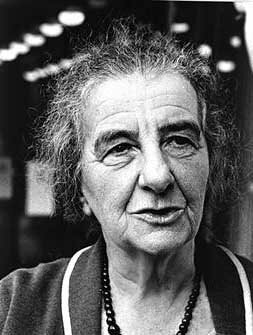 Although Goldberg grew up in a Jewish household she learned about Jewish mysticism in a college course and had very little background in eastern religions (which play a role midway through the film). This film is worth skipping unless you are highly curious about films that explore religious topics, or if you've got nothing better to do. Interesting fact: The Screenplay, while not that great was written by Naomi Foner, the mother of Maggie and Jake Gyllenhaal. 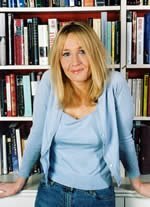 Heard something on the news from Harry Potter author J.K. Rowling and wanted to find it for myself on her official site (Jkrowling.com). I heard one of my friends talk about Rowling's site before...and man, she was right...it's absolutly fun and bizarre. So after 10 minutes of searching I found her rant "for girls only, probably..." where she criticizes the over emphasis of female thinness and her support for the song Stupid Girls by Pink. After she makes fun of celebrity girls with small dogs in oversize purses Rowling says "I've got two daughters who will have to make their way in this skinny-obsessed world, and it worries me because I don't want them to become empty headed, self obsessed emaciated clones; I'd rather they were independent, interesting, idealistic, idealistic, kind, opinionated, funny -- a thousand other things, before 'thin.' And frankly I'd rather they didn't give a gust of stinking chihuahua flatulence whether the woman standing next to them has fleshier knees than they do." You don't have to actually see the movie A Day Without A Mexican to imagine how horrible this film is. This 2004 released film by director Sergio Arau is poorly directed, and acted, but most importantly the script is horrible. I usually don't like mockumentaries anyways but what was a random DVD rental a year or so ago was about 100 minutes of bizarre torture. But my reason for posting is because I have read a few places (like here in the Denver Post) about how May 1, 2006 is scheduled to be a "Day Without A Latino." To help "Americans" see how essential Latino's are to our everyday life. And I've got to wonder...has this really been refuted. When recent legistlation has been discussed about the serious issue of illegal immigration politicians are generally interested in the voice of the Latino community, largely because it is so large, and increasingly growing. Immigration issues are a difficult topic because some people benefit and some people are hurt by illegals. I think illegal immigrants from Mexico and other Latin American countries will continue to enter with very little ability by the government to stop them, BUT I think this legislation with guest workers actually has more chances of opening and allowing greater immigration of people from countries like India and Pakistan, because they will be able to come in for cheaper wages legally. Anyways...We'll see how May 1st turns out, but if it is anything like the movie that tries to hard to raise awareness of the Latin contribution, it will fall flat and be uninspiring. Events like this create divisions more than unification. Side note: The original tagline for the film was "On May 14 there will be no Mexicans in California." It would have been funny if the organizers of this event would have pushed the date back to line up with the date in the movie. Chris Martin (29, Coldplay) and Gwyneth Paltrow (33) just had their 2nd baby...and as a follow up to their highly mentioned 1st childs name, Apple, they have named their new son Moses. Well according to an article I found about Apple Martin, apparently Paltrom told Oprah Winfrey part of the reason they chose the name Apple almost 2 years ago was because: "It conjured such a lovely picture for me - you know, apples are so sweet and they're wholesome and it's biblical - and I just thought it sounded so lovely and clean." Biblical? Well the word Apple appears in the New International Version of the Bible 10 times (click here to see the verses). It usually appears in the phrase "apple of your eye" or in Song of Solomon referring to the beloved as having breath like apples, or being conceived under an apple tree. Now Moses on the other hand is not the type of name I associate with a white kid who's last name is Martin. (C'mon say it "Moses Martin.") The name Moses occurs 803 times in the New International Version of the Bible. Also it's a little more popular than Apple being the 514th most popular name for babies born in 2004. (Apple has yet to make the top 1000). Picture with Paltrow and Moses from BBC article here. 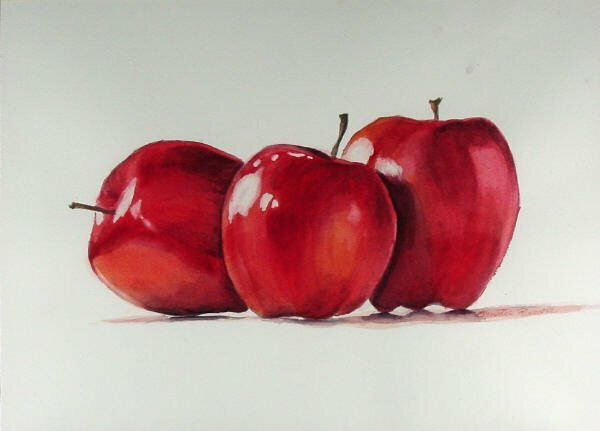 Picture of apples from here. When I listen to sound bites of Moussaoui trial I wonder everytime...why does there have to be so much evidence to show trauma and pain created by the September 11th terrorism attacks? Does Guilliani have to testify, or do horrible 911 calls need to be played for a jury? And today they are to release the black box tapes from the cockpits of the hijaked planes. 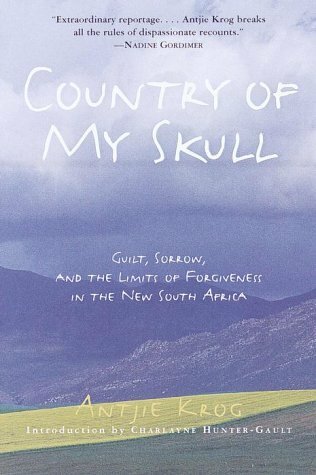 It reminds me of a book I've been trudging through called Country of My Skull: Guilt, Sorrow, and the Limits of Forgiveness in the New South Africa by Antjie Krog. 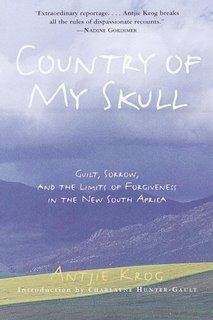 In this book Krog reports and digest the Truth and Reconcilliation Commission in South Africa in 1996 which Archbishop Desmond Tutu presided over. And there is a point early on in the telling and conveying of events and emotions that it seems like court testimony is no longer neccesary because the pain is obvious. Such is the way I feel with this court case to convict Al Qaeda conspirator Zacarias Moussaoui. Does the tragedy of 9/11 need to be decided on? 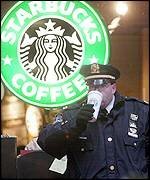 According to the San Francisco Chronicle crooks and robbers are finding new opportunities at Starbucks, I'm not talking special employment programs. Jaxon Van Derbeken in his article relays the story of a 40-year old man who got stabbed in a Starbucks and his $2500 Apple Power Book was stolen. Talk about impatient crooks, couldn't they have waited until he went to the bathroom? Maybe they felt uncomfortable because they wanted to play it cool but didn't know how to order a medium coffee. ("Is a tall coffee big, or is a tall coffee small" they were overheard saying...just kidding). Hey kids...be careful in your Wi-Fi hot spots...Criminals might be out to get your laptop! Info discovered at Starbucks gossip. 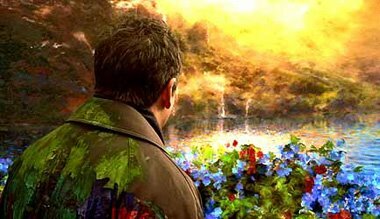 Do you remember the movie What Dreams May Come? This 1998 film certainly was no blockbuster with only a 15 million dollar domestic box office gross. But who was really interested in a heavy handed movie after suicide, the death of children, and the afterlife? Yet I remember watching it for the first time and thinking it was so cool. Upon rewatching this film with teenagers in my film class recently I was amazed at how much they loved this film. I think this film was ahead of the curve because it enforced an idea of "Private Paradises." I have realized recently that this generation has become very interested in creating their own private world that they have created. Why else have iPods, MySpace, Facebook, blogging and private Yahoo radio stations become so popular. No more do we want to listen collectively with others to music on the radio, we want our own music, chosen and arranged by us. And we want our own spaces in our life. We are quite content to plug in our earphones and listen to music while being in the same room as someone else. And in the same way that Robin Williams in "What Dreams May Come" what excited to be joined by his family and dog in his afterlife heaven, he certainly didn't think about being apart of his children's paradise or anyone else's. Because we want everyone to partake in the perfect world we create. That's why we want people to visit our blogs and post our preference, likes, and dislikes and even what songs we're listening to today. And movie theaters are wondering why we just want to watch the DVD...Can't the see it's not a problem with the movie theater, it's just that we want to enter our own perfect environment for enjoying media...We want our own movie snacks, and to sit on our own coach and press pause when all the diet cherry vanilla Dr. Pepper catches up with us. And what about TiVo and recordable television...It's not about commercials, it's about being in control and creating our individualized world. Will there ever be a point where the pendulum swings back and we once again look for collective experiences? Or will we continue on this trajectory of creating our own private paradises? 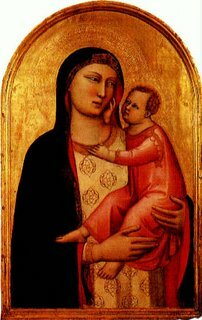 Many Strange Culture posts have covered the Da Vinci Code Lawsuit put forth by Michael Baigent and Richard Leigh claiming that Dan Brown's book stole their ideas (Baigent and Leigh wrote book "Holy Blood, Holy Grail"). Well today the Judge rejected the claims brought forward in the suit (news story here). And while I'm sure Dan Brown is relieved, I have from the beginning seeing this as a giant publicity stunt. Ron Howard, Dan Brown, Todd Hallowell, Columbia Pictures, Imagine Entertainment, Sony Pictures Releasing will all benefit from the free publicity the film received. Although many wondered and speculated, the film will still come out July 8th with Tom Hanks playing Robert Langdon. Baigent and Leigh's book "Holy Blood, Holy Grail" is now 24 years old but is selling 7,000 copies a week in Britain and even more in the United States. (See my first post in February realizing the Baigent/Leigh publicity benefit here). Baigent also has a new book coming out “The Jesus Papers: Exposing the Greatest Cover-Up in History.” He is receiving free publicity in connection with this law suit as well. (To see more on the Jesus Papers you can read my post and criticism in my post here). Also read another AP story about the Da Vinci code that came out today. The Christian Council of Korea is filing a court injection with Sony Pictures Releasing of Korea to stop movie distributors from showing the film. There claim "it defiles the sanctity of Jesus Christ and distorts facts." You can read that story here. The top picture is of Dan Brown, the second picture is Michael Baigent. 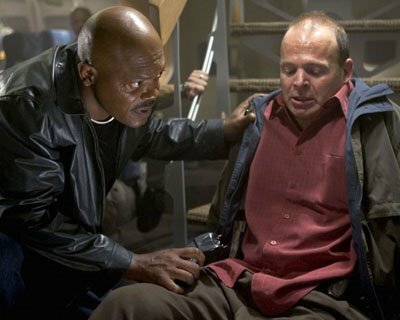 Samuel L. Jackson has appeared in over 80 films and television shows since 1990...so I ask you...click on the link to his name and look at all the roles he's play. What's Jackson's best work and what's Jackson's worse. Now it's your turn to vote by leaving a comment below! *The names have been changed to protect the peed on. Did you know Jesus walked on ice? Well, because a Oceanography professor at Florida State University did a study on atmospheric pressure and water in Northern Israel lead physorg.com to publish an article that states that: "...it's more likely that [Jesus] walked on an isolated patch of floating ice." And if this were not ridiculous enough...the story has also been picked up by CNN. The professor who did this ridiculous study is Doron Nof, who published his article in the Journal of Paleolimnology. Nof isthe same professor who's research I learned about in college. In the early 1990's Nof did a popular study that showed how wind and sea conditions could have naturally caused the parting of the Red Sea. I don't understand Nof...he believes in the biblical history enough to want to prove how Jesus' miracles could have actually happened, but not as miracles at all. Can he, Florida State University, the Journal of Paleolimnology and CNN not step back enough to see the ridiculousness of this. All I know is that there is a lot of notariaty in reinventing new explinations of Biblical History: Holy Blood, Holy Grail, Da Vinci Code, The Jesus Papers. Also Kanye West might write a new song called "Jesus Floats." Found this first at //re:generative divergence. Movies about painters - they're kind of boring but bizarre at the same time. The stories are somewhat unaccesible to main stream america but they give an opportunity for actors and actresses to play some bizarre characters. As a result, the artist bio-pics seem to get academy award nominations. This year's artist film seems very interesting to me. It's called Goya's Ghost directed by Milos Forman (One Flew Over The Cuckoo's Nest, Hair, Ragtime, Amadeus, The People vs. Larry Flynn, Man on the Moon). Can we almost guarentee this movie will get Academy Award nominations...I think so. Possibly some technical awards, but especially for the two supporting players. Today's a big DVD Release day. First: Brokeback Mountain, the 2-disk Directors Cut of Crash, and the Chronicles of Narnia: The Lion, The Witch, and the Wardrobe are all coming out on DVD today. Obviously the importance of DVD sales is higher than ever and we're seeing the DVD's come out very very quick, just like how we saw King Kong come out last week. This is good for the companies that make movies, but horrible for the theathers...but as I learned with articles surrounding the Soderbergh movie Bubble, that studios are making more money off of DVD's than theater runs. (Also, coming out today the Greatest Game Ever Played, Bee Season, Little Manhattan, Ushpizin, and the 1959 movie The Nun's Story) . But Second: Studio's are trying for a new type of simultaneous release today as Brokeback Mountain will be the first film to be a download-to-own video the same day as the DVD release. Two new sites CinemaNow.com and Movielink are offering downloadable movies. These movies are usually $20-27 to download right now, and can only be played on a computer or by hooking your computer up to a TV. You can read more in E!online's article Brokeback Mounts Revolution. Sony and Lionsgate will provide 75 other titles to CinemaNow including Memoirs of a Geisha and Saw II. I'm not a mom, but my goodness, what are people feeding their kids?? Someone ple ase help me out? How does this happen. I'm way ahead of the curve on this MSNBC/Newsweek April 10, 2006 issue...I published about "United 93" and "World Trade Center" in my post Two of the 1st 9/11 Films Ever. 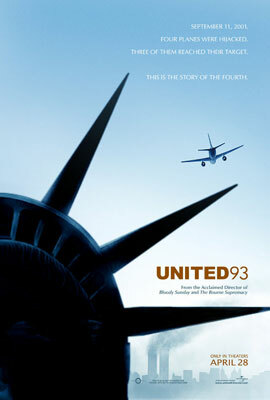 I knew that the movies title was changed to United 93 when A & E did there own movie called Flight 93. But I didn't realize that this show drew in the higher number of viewers in A & E history (5.9 million viewers). This makes me think that the film might do better than I thought. I didn't know about this until my wife e-mailed me this article. But I've written abo ut Michael Baigent a few times on this blog. He is one of the authors of Holy Blood, Holy Grail, and he is currently fighting a law suit in London over Dan Brown's book The Da Vinci Code (Da Vinci Code Delay? Fact or Fiction?). Baigent and Richard Leigh believe that Brown stole their research and ideas when he wrote his very popular story. 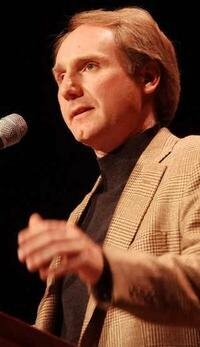 Well this article talks about Baigent's new "non-fiction" book called The Jesus Papers where he "uncovers" various hidden stories from the gospels...including the fact that Pilate had rigged a secret situation allowing Jesus to live, there were drugs in the vinegar spounge, and Jesus was removed from the cross actually alive and that he lived much longer after the crucifiction than suggested. The article is very long, but pretty interesting. But to me the far more interesting thing is it makes me very suspicious of Baigent and Leigh's lawsuit. Even in the first post I wrote on the topic I was suspicious of it being a publicity stunt for Brown's upcoming film and to help resurge the sales of "Holy Blood, Holy Grail." (In fact I noted Holy Blood, Holy Grails sales success, Mini-Update: Da Vinci Code & Name Collision & that Random House has the publishing rights for both books in this post.) But now I also see how Baigent could have had even more interest in the publicity with this book on the horizon. Apparently in 2005 a Federal Law was passed that beginning in 2007 we will set our clocks forward three weeks earlier in (March 11th next year) and one week later ending November 4th. My guess is that the excuse was to save on energy cost...but who knows? Just a guess. I found out about it at Cave News but I confirmed it at the Astronomical Applications department of the U.S. Navy.